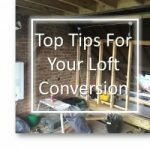 We are alive and well after the loft conversion. 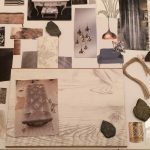 You may have been wondering where we are – that thought has crossed our minds too! There was I thinking we’d have it all decked out in a week. Reality check! These things take a while. So thought I’d start with introducing the hallway. Of course, we now have an extra flight of stairs. This lends itself rather well to forgetting what we have gone up for. We had a good idea of what we wanted and have always dreamed of having a carpet runner. So, with our blank canvas, we had the opportunity to start afresh. 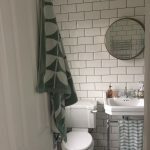 We opted to keep the walls a neutral colour (Natural Hessian) primarily because we have a tiled hall floor and we wanted to make changes that were in keeping with this. It is one of the things that we really love in the home. We had this floor laid when we moved in back in 2001. 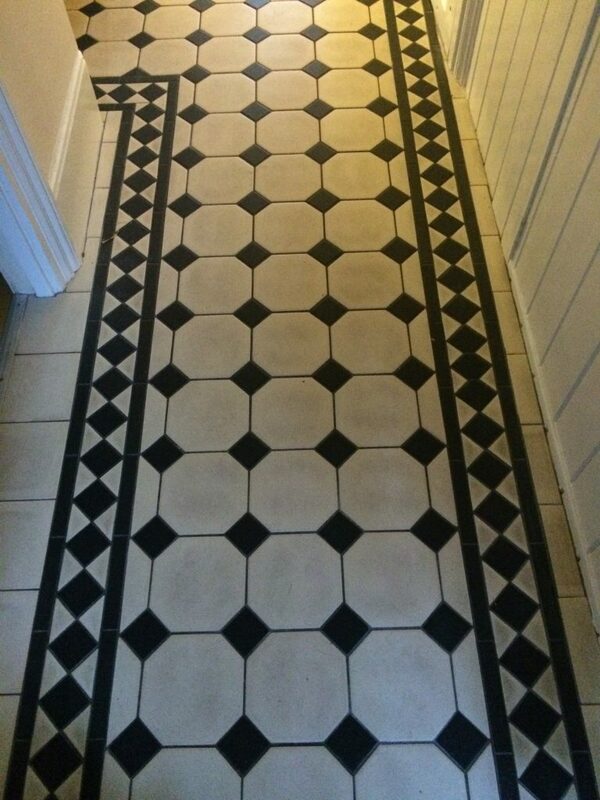 This type of floor would probably have been an original feature of a house like ours which was built circa 1905. Sadly, fashion over the years meant that somewhere along the line it was removed. 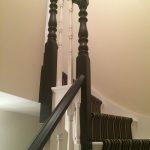 I also saw on the Living etc Home Tours a black stair rail which I thought would fit in rather well with the neutral walls and hallway floor. 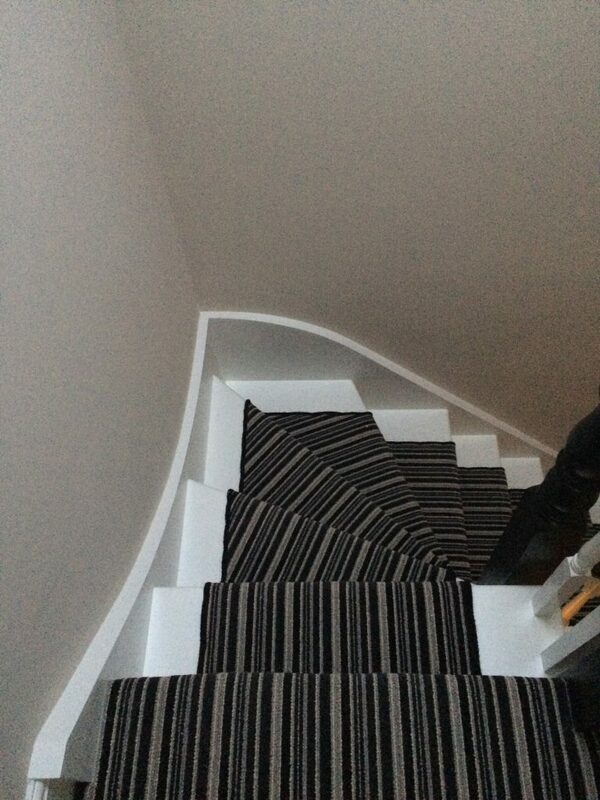 The rest of the paintwork was white which included the stairs themselves. 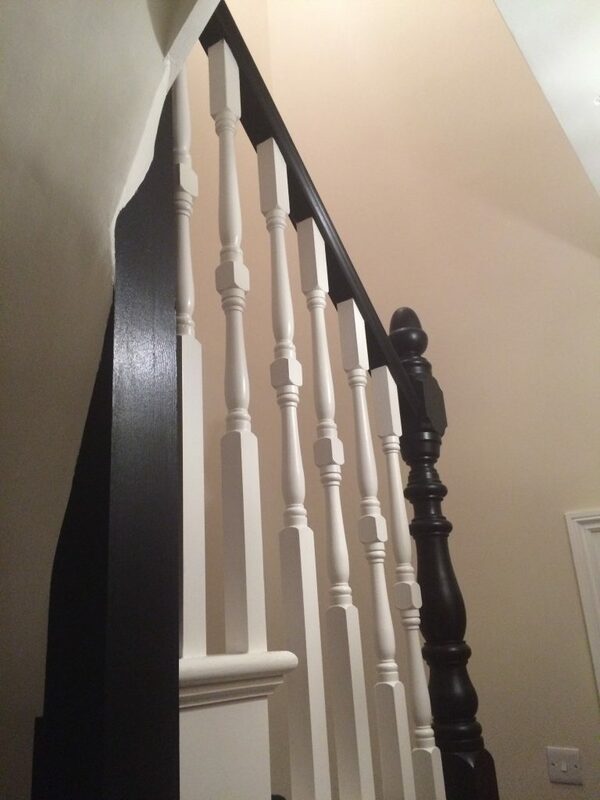 We went for it and opted just to have the posts and handrails painted in a matt black with everything else white. 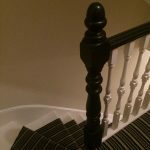 You will see how our carpenter has matched our new spindles to the existing ones. And then for the choice of carpet. Once again, we were agreed on stripes. Sounds simple – right? Yes, we thought so too. 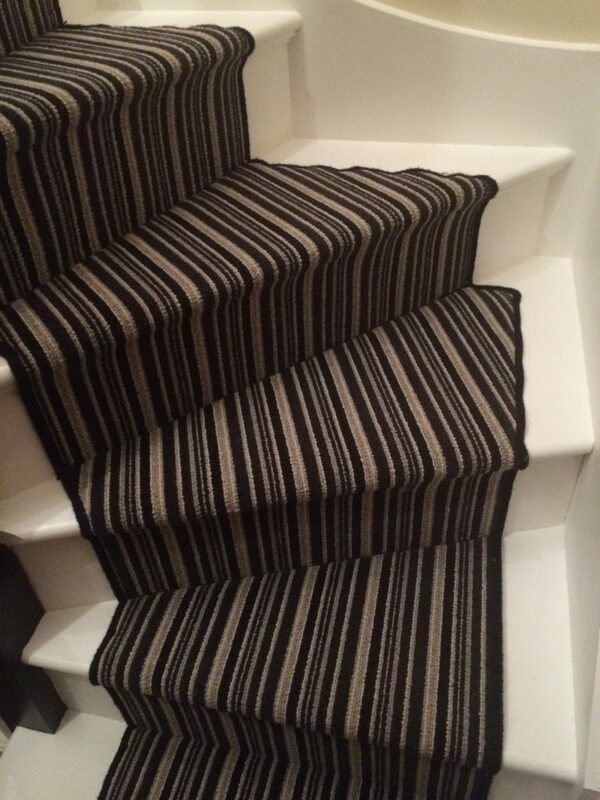 But if you have ever shopped for striped carpet, you will know that there are stripes and there are stripes. Couple this with not being 100% sure on the colour we should go for and you’ve got yourself a whole load of choice. 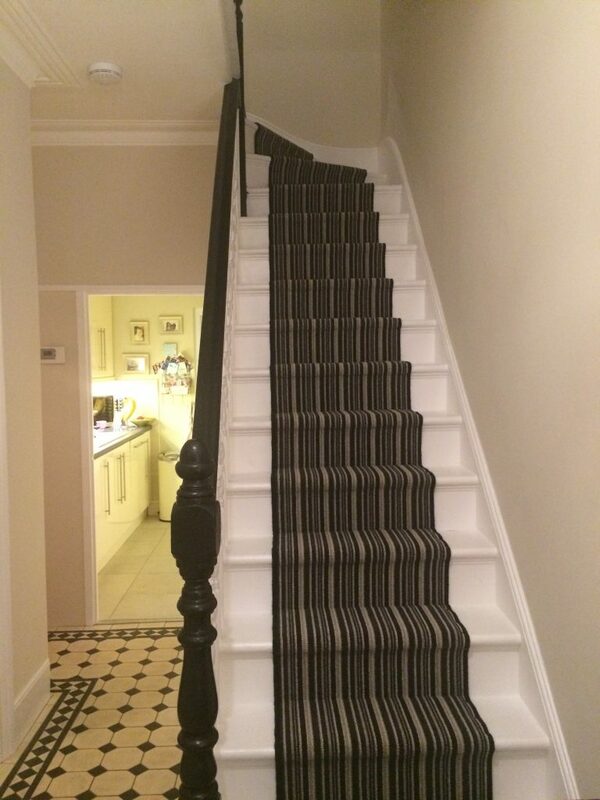 After taking lots of samples back and forth, we finally decided that a primarily black striped mix would look best as well as being practical on a well used staircase. 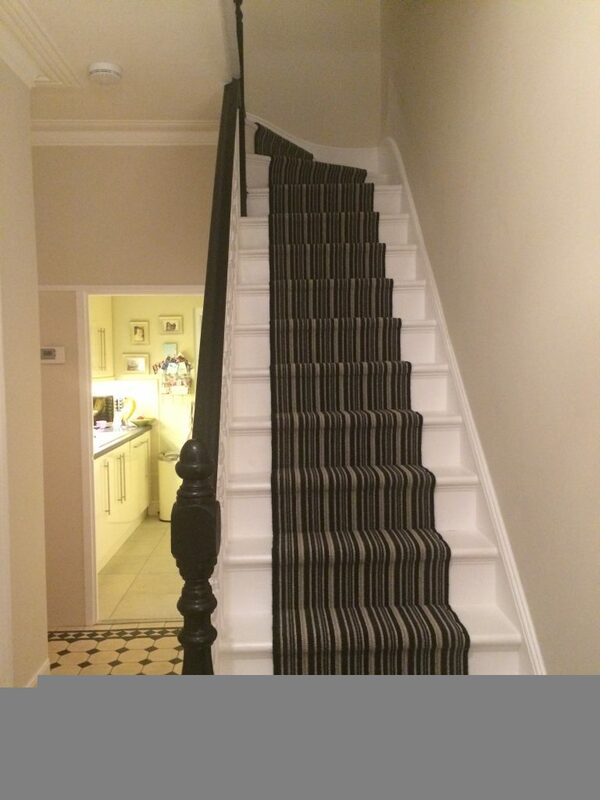 We chose one with a grey and a beige stripe alongside the black which worked well with the colour of the walls too. I took the picture below on one leg, leaning backwards to try to capture the view looking down (without my feet in it). Don’t forget to look away! I also have some useful pointers which I have included below. The parts where we had to make choices. Obviously not all stairs run straight. There will be several turns. Equally the stairs on a turn will be larger. 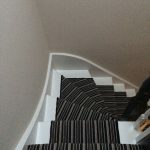 It is on these stairs that you have the choice of whether to have the carpet cut to follow the previous stairs or whether you have the carpet squared off so that the pattern follows. The third stair up is the one to look at in the picture below. With the advice of the fitter, we chose to have the carpet squared off. It’s probably not something you would notice if it wasn’t pointed out. Nevertheless, you may be given the choice. As tends to be the case with old houses, the existing framework can be a little higgledy piggledy. Generally things don’t line up, neither is anything straight. It makes hanging things interesting! One of our stairs happened to be much larger than the rest so the squaring off technique didn’t look as it should. 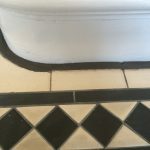 After much deliberation (myself and the carpet fitter), we decided that following the existing line was the best way here. Again, you wouldn’t notice unless you were asked. And then there is the landings. 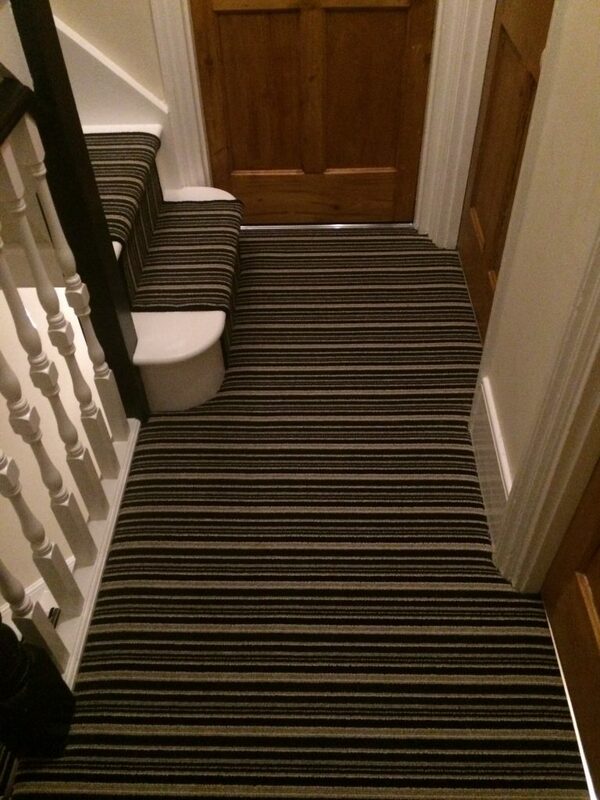 Do you want the whole landing carpeted or the runner with gaps around the edges. We opted for the former. 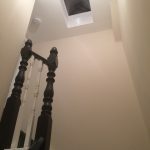 The runner is tacked under the top stair and then the landing carpet is laid as a separate piece. And the same rule applies on the next flight of stairs. 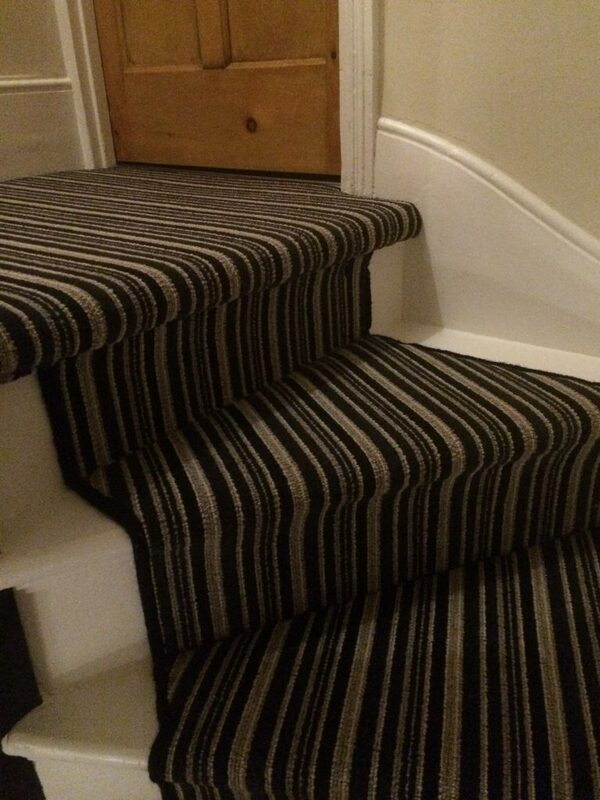 Notice how the landing carpet is laid so that the stripes follow. 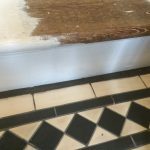 Another little conundrum we had was that where the hall tiles finished and there had previously been a carpet – well, we had a rather nice gap. See below. No runner was going to fill this little crevice. We were recommend several solutions, none of which were available in time. As luck would have it, Iron Man came to the rescue by using a dark grey grouting and once again, you wouldn’t notice – unless it was pointed out. And that is the area complete. We are really chuffed with the results and our choices. 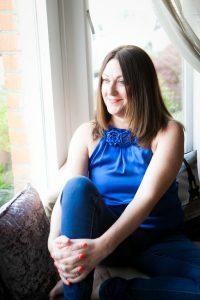 We also used a local independent retailer which is good to be able to do. Fabulous service. It is probably also worth pointing out that the fitting is done in two phases. The first is to cut the carpet out. Every stair is an individual piece. The carpet is then sent away for ‘whipping’. That is edging to you and I. You will need to choose a colour for your whipping. We chose black. If you look closely, you will see this in the pictures. The second visit is for the actual laying of the carpet. This took about four hours. It’s a very fiddly job. Next stage is to adorn the walls with some love. And boy do I love a photograph and some wall art. This will need lots of thought. Those bare walls are aching for some love, it looks like nobody lives here at the moment! 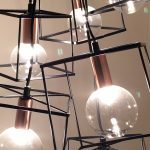 And lighting is also on the agenda. Good! 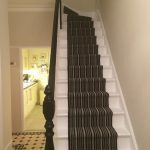 I’m glad you put this post up so I have a virtual version as well as the real life version I saw( when I foisted myself upon you for Blogfest) because we need a new stair carpet and love stripes. 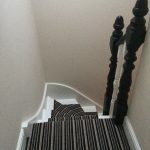 However, because ours is a new house we don’t have lovely solid wood stairs so we’ll need to have our carpet all the way across. Boo Hoo!!! 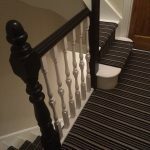 I do love your choice of colours for the stair rail and the flooring in the hallway. It really does have wow factor. All you need is a massive framed print of the selfie I took of all of us on your sofa last week and the look will be complete! Thanks Jane. I’ll see how the photo comes out when enlarged! 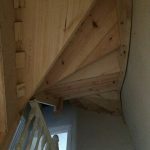 What are your stairs made of then as a matter of interest? I want to say plywood? Think that’s what it is. – New houses!!!! It looks lovely, I may move in! It looks great! 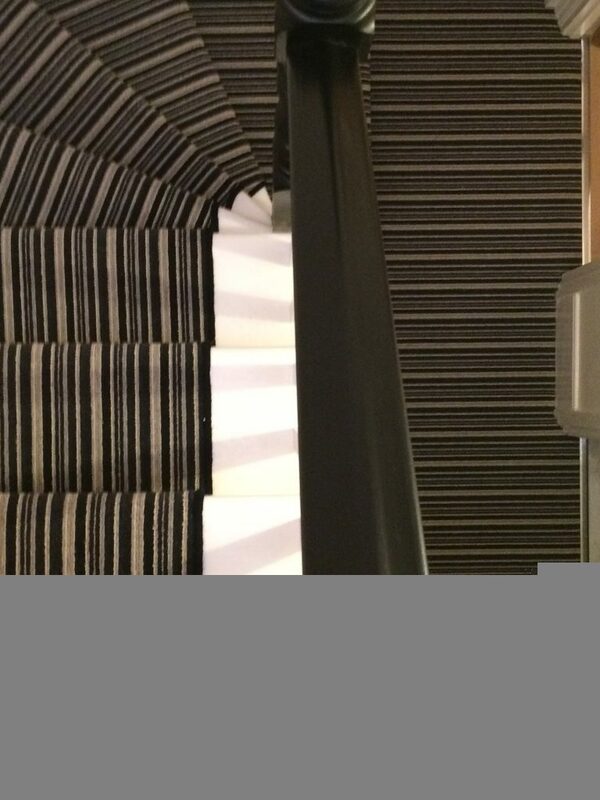 I would love a staircase with a carpet runner on it, I think it looks really smart. Blimey! Who knew it would be so complicated! Well done, Nick! It looks fabulous. Can’t wait to view in person!!! Thank you Fionnuala. I imagine the grey looks very stylish too – obviously the black is a little more forgiving in terms of hand prints. We had white before and that showed every little detail. Thank you for your comment.